Plasm is series of interactive art installations investigating novel methods of human interaction with artificial life forms. This series is the result of ongoing artistic collaboration between Rob Myers and Peter Broadwell, with other members of the Plasmatics team. The initial piece, Plasm: A Fish Sample, was proposed and installed in 1985; subsequent installations in the series have followed every few years. Plasm: In the Breeze. Swinging out over a synthesized creek, viewers stir up the artificial life forms therein. 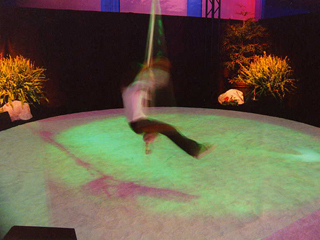 Engaging kinesthetic immersion takes place within themed surroundings, where two rope swings track the participants' position using linear position sensors mounted at the pivot point, 20' overhead. Plasm: Not a Crime. 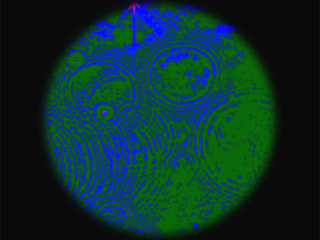 Participants create and share their images securely, without resorting to illegal encryption, in a visual encounter with chaffing and winnowing. Each image submitted is shattered into thousands of miniscule tagged packets and churned out into the transmission flow of billions of internet packets. A recovery key card is printed for each submitted image. At remote retrieval stations, the key card is optically scanned for the ID used to winnow matching packets out of the passing internet flow, reassembling the secret image from the chaotic flux. 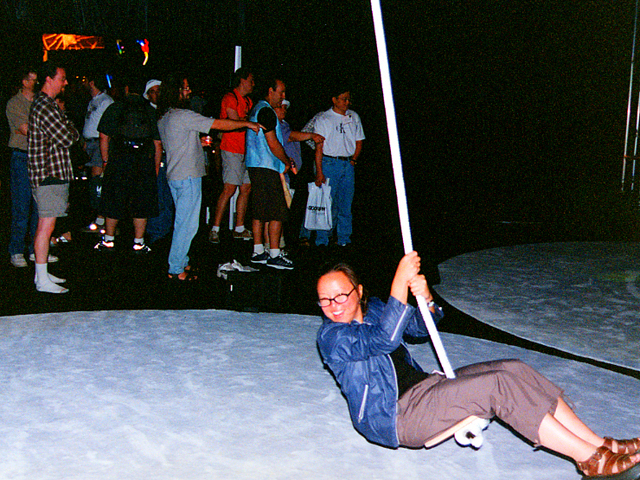 Installed at Ars Electronica 98, Linz, Austria, 1998. Plasm: Yer Mug. A 50's themed diner provides the setting for an interactive encounter with disturbing denizens in the virtual mirror across the counter. On-screen breakfast reassembles itself into characters who react to the customers' every move. Behavioral "bacon", "eggs", and "toast" a-life elements are motivated via optical recognition triggers, force sensing stools and counter. 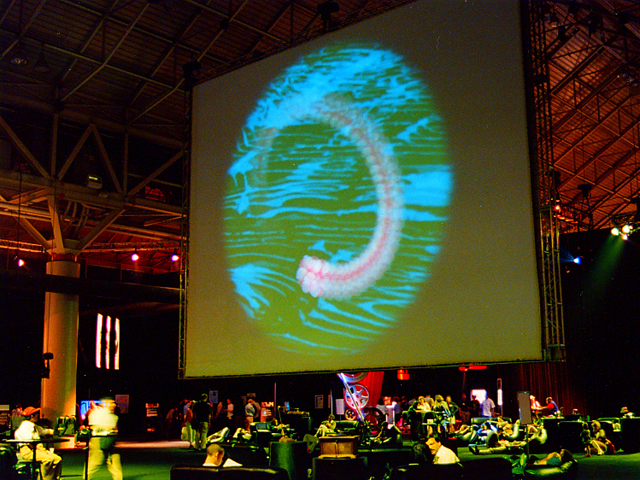 Installed at SIGGRAPH '96 Digital Bayou, New Orleans, 1996. Plasm: A Country Walk. A custom force-feedback leash is used to walk a virtual dog down an endlessly unfolding country lane. 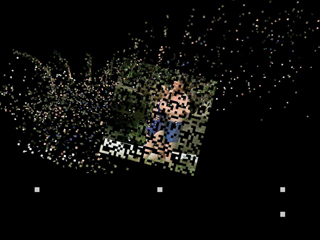 The simulation is driven by the 3DO game console's low-cost rendering hardware, with rear-screen projection filling the participant's view. Installed at ISEA '94, Helsinki, Finland, 1994. Plasm: Above the Drome. Three networked skyboards equip visitors to surf freely throughout a shared virtual space. Each fiberglass skyboard is a custom full-body input device, with force-sensing resistors driving the flight simulation for the occupant's on-screen avatar. 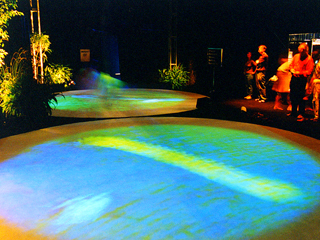 A large rear-screen projection in front of each skyboard renders the cumulative adventures of all three surfers in a common, infinitely wrapping space, as they dive below the waves to slalom through the fishes, or soar overhead to trail confetti across the sky. Installed at SIGGRAPH '91 Tomorrow's Realities Gallery, Las Vegas, 1991, and again by invitation at La Villette Museum of Science and Technology, Paris, France, 1992. 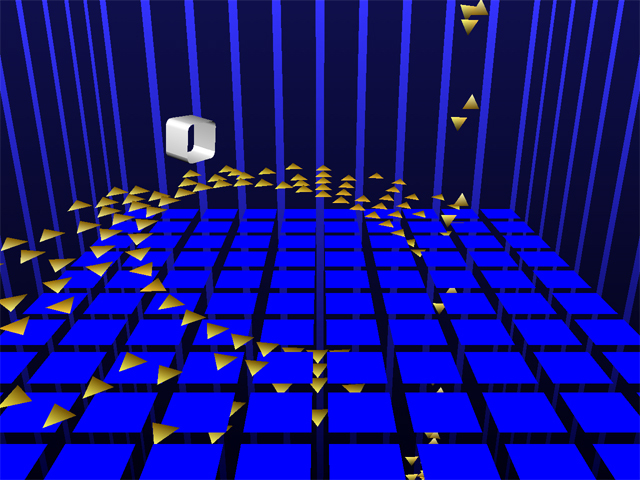 Plasm: A Nano Sample. A large, empty room becomes the portal into an alternate universe, explored via two monitors pushed about on rolling stands. 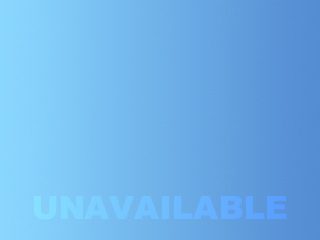 When viewed through the screen of each exploratory vehicle, clouds of passive brass flakes are swirled and grasped by unseen winds flowing through the space, while being herded and chipped off by the intrusive observation vehicles. 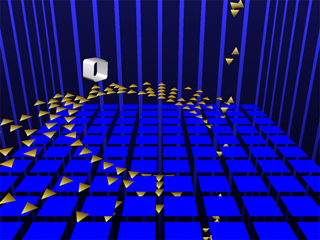 A variety of different object systems (flying carpet, chaotic vortex, growing plant structures) compete to populate themselves with the shared inventory of flakes, snatched on the fly by conflicting attractors. Input tracking is performed by optical detection of infrared LCDs mounted on the rolling monitor stands. 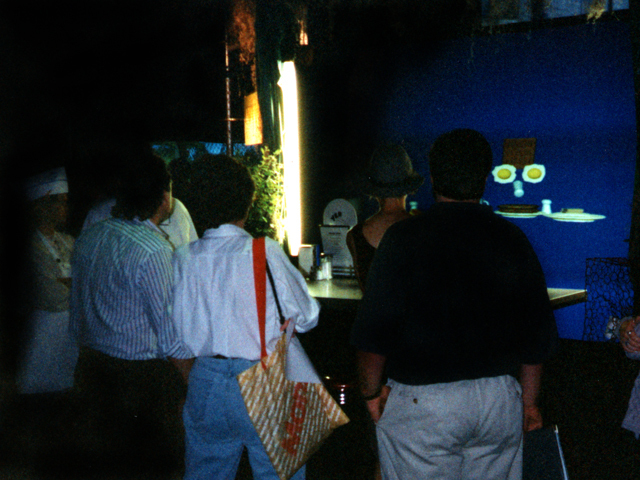 Installed at the SIGGRAPH '88 Art Show, Atlanta, 1988. Plasm: A Fish Sample. The initial installation in the Plasm series, this piece was inspired by Allen Kay's talk on artificial life forms and simulated ecologies at SIGGRAPH the preceding year. 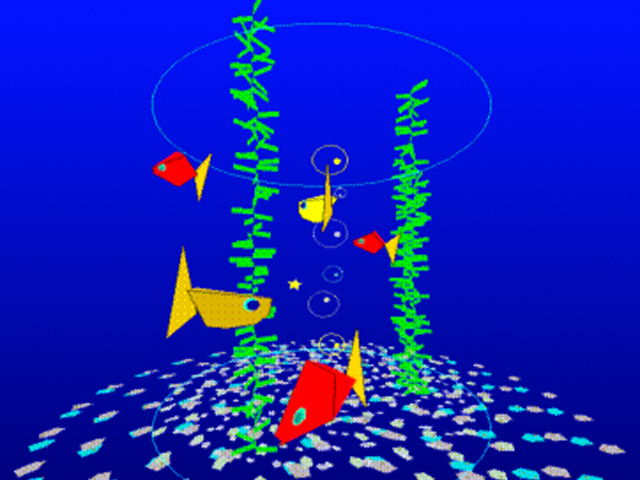 A real-world living room setting, complete with sofa, coffee table, potted palm, and fishing magazines, features a virtual aquarium populated with two species of artificial life forms. 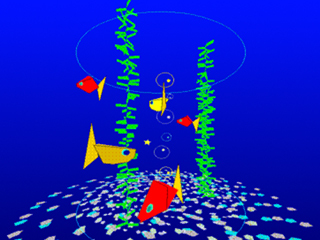 An object-based behavior system controls reproduction, predation, and a host of other unexpected activities. Installed at the SIGGRAPH '85 Art Show, San Francisco, 1985 and at the SIGGRAPH '86 Art Show Retrospective, Dallas, 1986.